Yuneec Mantis Q is small and lightweight at 16.7 x 9.7 x 5.6cm / 6.6 x 3.8 x 2.2in when folded; it weights of 0.5kg / 1lb. The drone's integrated camera supports recording video and capturing images at 4800 x 2700 (16:9) and 4160 x 3120 (4:3), as well as recording Full HD video with electronic stabilization. Still images are saved to a microSD card in either DNG or JPEG formats. Users can control both the camera and the drone using voice commands, using phrases like "Take a picture" or "Take a video." Gesture Control enables the user to take a selfie using a hand wave, and there's also face detection that snaps a photo when the camera detects a smile. Recording modes include Orbit Me and Point of Interest. Yuneec is now accepting pre-orders for Mantis Q. 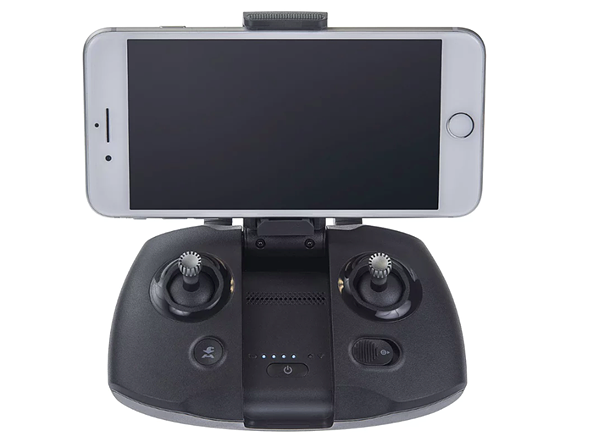 The drone with a controller, single battery, spare propellers, a three-port charger, power supply, and USB cable is $499.99 USD. There's also an X-Pack that adds three batteries and a travel shoulder bag for $649.99 USD.